The Maples is ski-in/ski-out to the Ace Family Run and also opens onto Hirafu’s main street. 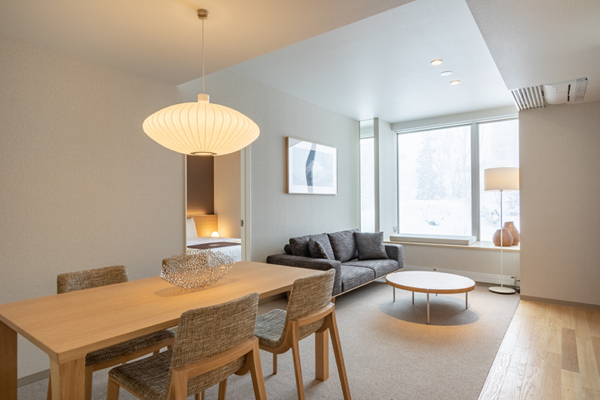 The Maples seamlessly connects Hirafu’s village and nightlife with the slopes – ski-in/ski-out access on one side and access to Hirafu’s bustling main street, Hirafu-Zaka, on the other. 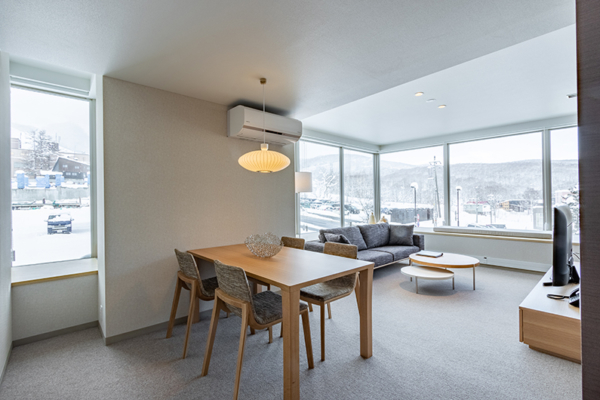 Bright, spacious apartments with floor-to-ceiling windows taking in the surrounding ski slope, village, forest and Mt Yotei views make it an absolute delight to retreat to. 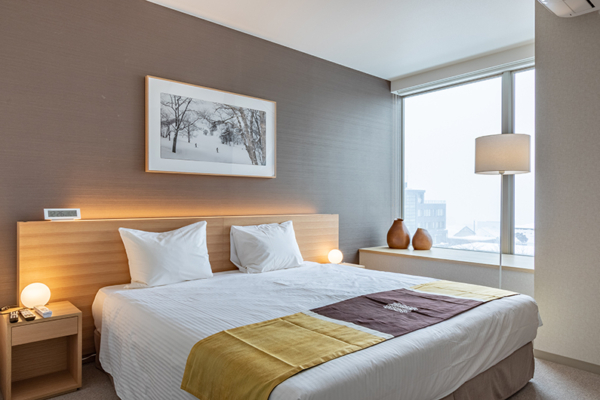 Our team stayed here – take a look at our view-filled stay at The Maples Niseko. 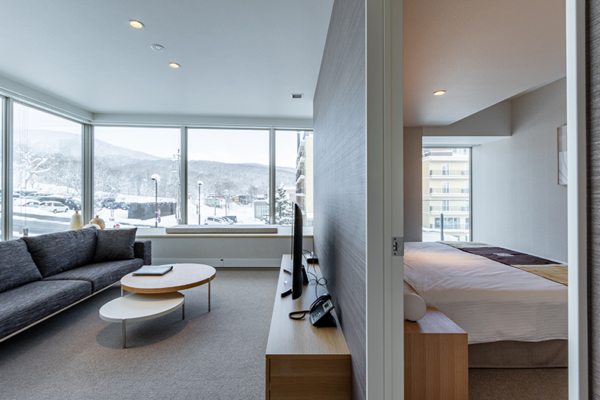 The Maples offers a choice of 73 apartments across six storeys, designed to make the most of its ski-in/ski-out location for your enjoyment and convenience. 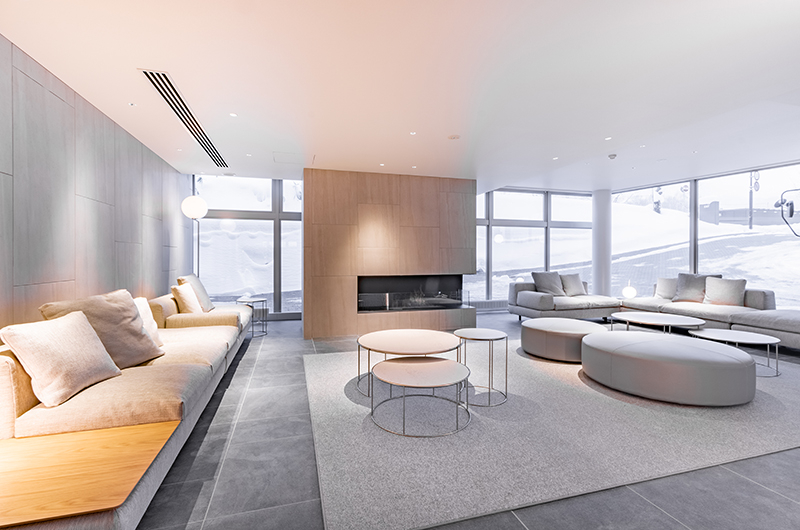 A dedicated ski room opens directly onto the slopes with guest-only security passes required to enter. Also opening out onto the slopes is a fantastic café restaurant, Roketto, by the chef of famous Singaporean restaurant Wild Rocket. 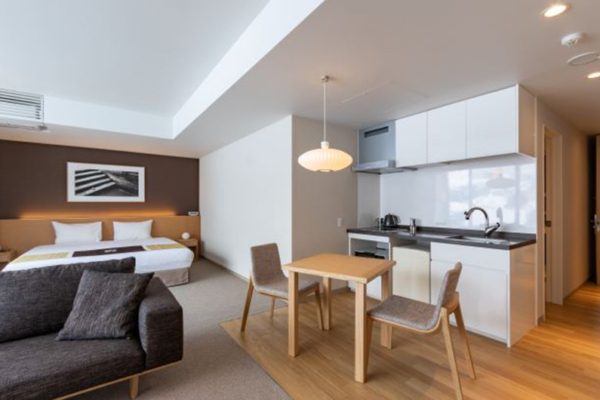 Apartments range from studio to 3 bedroom and penthouse suites, with a focus on simple, light, airy tones and natural materials throughout. 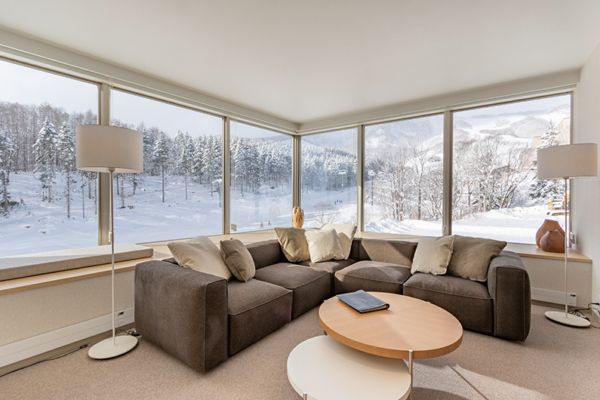 The floor-to-ceiling windows allowing in natural light off the ski slopes accentuates the bright, alpine atmosphere. 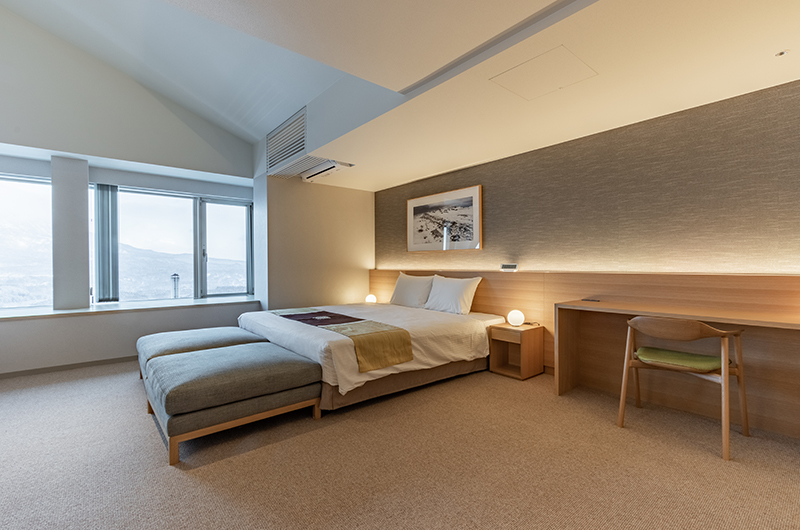 The building is designed to take advantage of the views, with one side facing towards Mt Yotei and the other towards the ski slopes. A 24-hour front desk staffed by an award-winning management team are on standby to check you in and take care of your stay. If you need advice or help booking activities or anything else, the concierge desk in the lobby can point you in the right direction. There are nine of these apartments on Level 1 with resort village views. They have a two-person dining table and kitchenette with sink, cooktop, fridge, microwave, kettle, toaster, cutlery, basic food preparation utensils. There is a 40-inch TV with streaming media, coffee table. It has western bedding, closet, washer/dryer. No extra guests permitted. There are 10 of these apartments located on Levels 2 – 5 with resort village views. They have a two-person dining table and kitchenette with sink, cooktop, fridge, microwave, kettle, toaster, cutlery, basic food preparation utensils. There is a 32-inch TV with streaming media, western bedding, washer/dryer. No extra guests permitted. 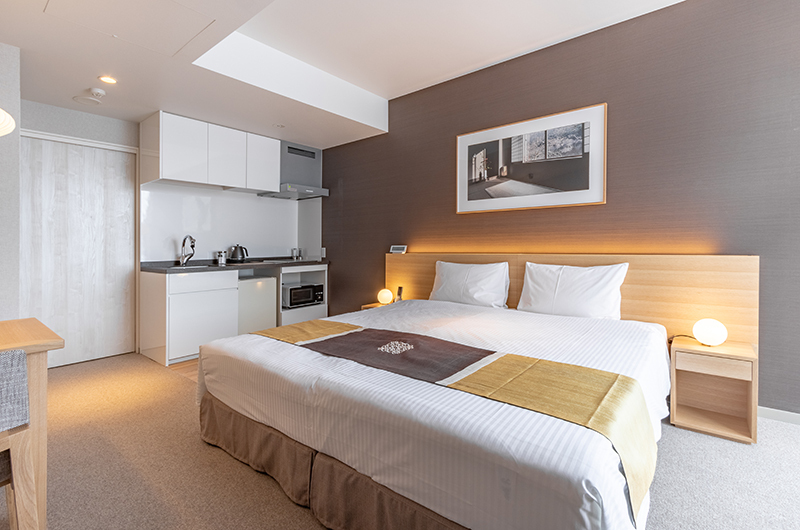 There are eight of these apartments on levels 2 – 6 with mountain views They have a two-person dining table and kitchenette with sink, cooktop, fridge, microwave, kettle, toaster, cutlery, basic food preparation utensils. There is a 32-inch TV with streaming media, western bedding, washer/dryer. One extra guest is permitted on a futon mattress (see “Extras” below). There is one of these apartments on Level 6 and it has a view of the ski mountain. It has a two-person dining table and full kitchen including cooktop, oven, microwave. There is an 32-inch TV with streaming media, western bedding, washer/dryer. One extra guest is permitted on a futon mattress (see “Extras” below). There are seven of these apartments on level 2 – 5 with resort village views. They have a eight-person dining table and full kitchen including cooktop, oven, microwave, dishwasher, rice cooker. 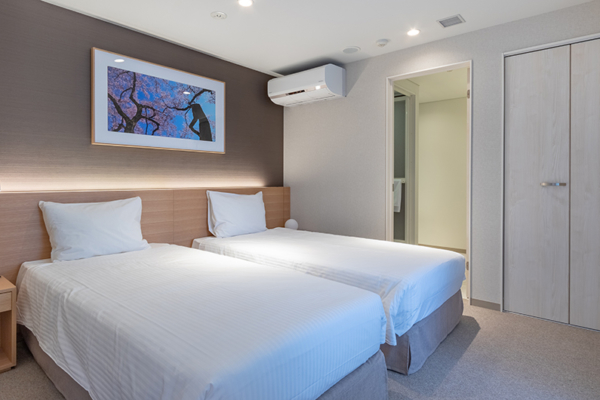 There is a 40-inch TV with streaming media, four-person lounge, western bedding, washer/dryer. Two extra guests are permitted on futon mattresses (see “Extras” below). 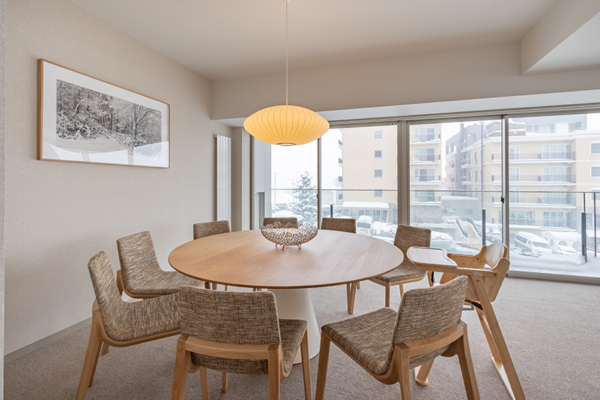 There are three of these apartments on levels 3 – 5 with views of the ski runs. They have a eight-person dining table and full kitchen including cooktop, oven, microwave, dishwasher, rice cooker. There is a 40-inch TV with streaming media, five-person lounge, western bedding, washer/dryer. Two extra guests are permitted on futon mattresses (see “Extras” below). There are four of these apartments on level 2 – 5 with ski run views. They have an eight-person dining table and full kitchen including cooktop, oven, microwave, dishwasher, rice cooker. There is a 40-inch TV with streaming media, five-person lounge, western bedding, washer/dryer. Two extra guests are permitted on futon mattresses (see “Extras” below). There are seven of these apartments on levels 1 – 3 with resort village views. They have a four-person dining table with full kitchen including cooktop, oven, microwave, dishwasher, rice cooker. 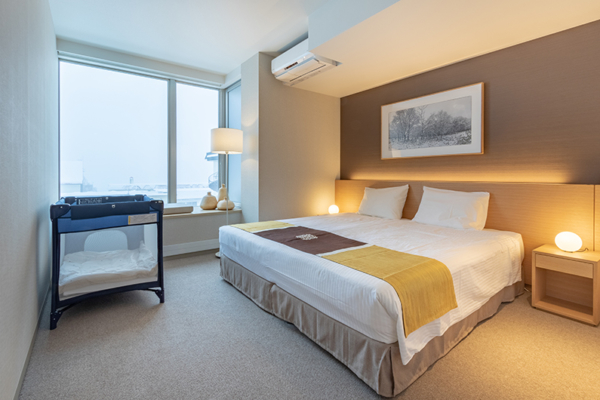 There is an 40-inch TV with streaming media, two-person sofa, western bedding washer/dryer. Two extra guests are permitted on futon mattresses (see “Extras” below). There are 23 of these apartments on level 2 – 5 with resort village views. They have a four-person dining table and full kitchen including cooktop, oven, microwave, dishwasher, rice cooker. There is a 40-inch TV with streaming media, two-person sofa, western bedding, washer/dryer. One extra guest is permitted on a futon mattress (see “Extras” below). There are two of these apartments on the top floor with mountain views. They have a four-person dining table and full kitchen including cooktop, oven, microwave, dishwasher, rice cooker. There is a 40-inch TV with streaming media, two-person sofa, western bedding, washer/dryer. Two extra guests are permitted on futon mattresses (see “Extras” below). 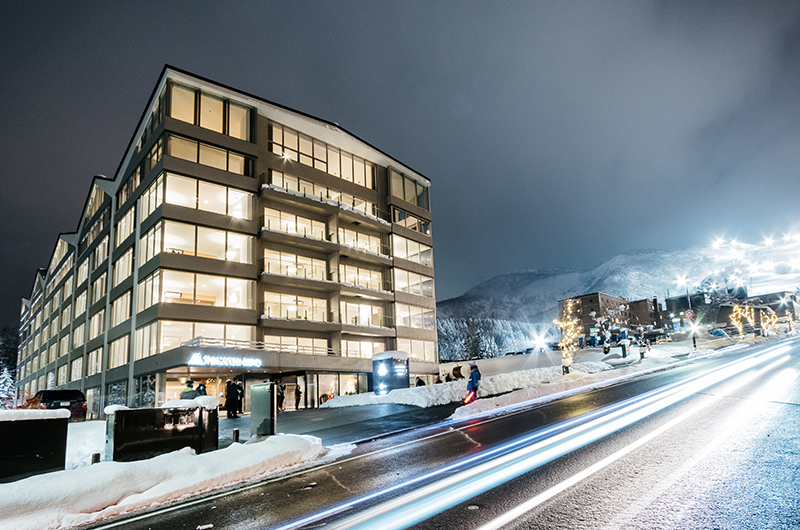 There are two of these apartments on the top floor with mountain Mt Yotei views. They have a six-person dining table and full kitchen including cooktop, oven, microwave, dishwasher, rice cooker. There is a 40-inch TV with streaming media, five-person lounge, two-person sofa, western bedding, washer/dryer. Two extra guests are permitted on futon mattresses (see “Extras” below). There are nine of these apartments on Levels 2 – 5 with resort village views. They have a six-person dining table and full kitchen including cooktop, oven, microwave, dishwasher, rice cooker. 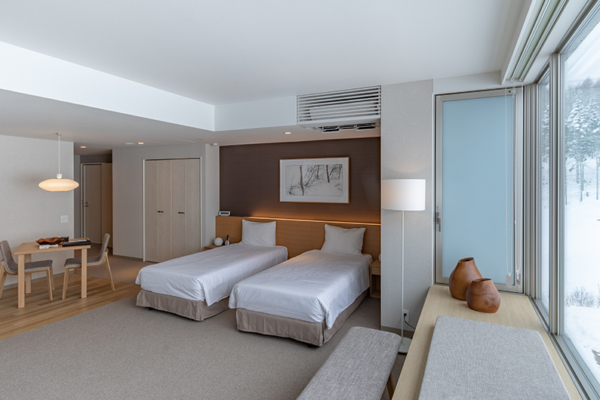 There is a 40-inch TV with streaming media, five-person lounge, two western bedrooms and the half bedroom which is a space with tatami (woven straw mat) floors on which one futon can be placed (it has an en suite). Washer/dryer in apartment. One extra guest is permitted on a futon mattress (see “Extras” below). There are seven of these apartments on levels 2 – 5 with resort village views. They are a 2-bedroom + Studio apartment. They have an eight-person dining table; full kitchen including cooktop, oven, microwave, dishwasher, rice cooker; plus the Studio has a kitchenette. There is a 40-inch TV with streaming media, five-person lounge, western bedding, en suites and TVs in all bedrooms, washer/dryer. Two extra guests are permitted on futon mattresses (see “Extras” below). 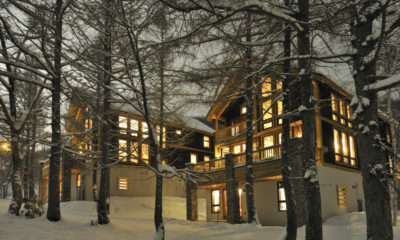 There are three of these units on Levels 3 – 5 with ski run views. They are a 2-bedroom + Studio apartment. They have an eight-person dining table; full kitchen including cooktop, oven, microwave, dishwasher, rice cooker; plus the Studio has a kitchenette. There is a 40-inch TV with streaming media, five-person lounge, western bedding, en suites and TVs in all bedrooms, washer/dryer. Two extra guests are permitted on futon mattresses (see “Extras” below). 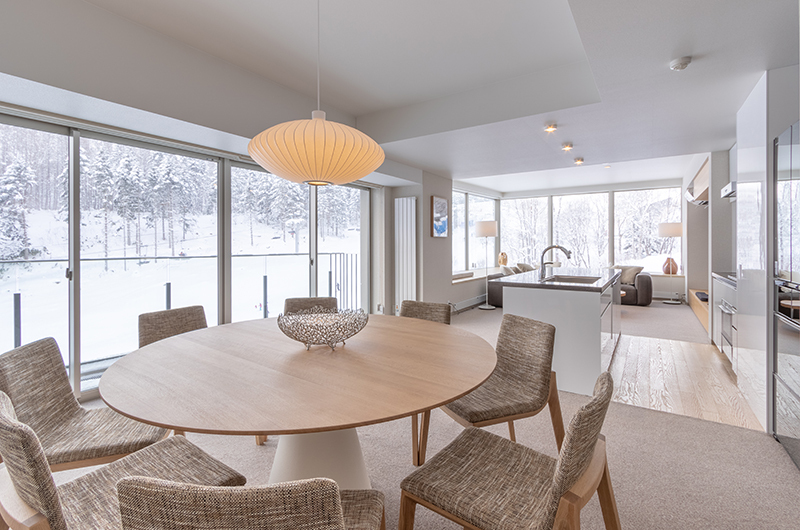 There are four of these apartments on levels 2 – 5 with ski run views. They are a 2-bedroom + Studio apartment. They have an eight-person dining table; full kitchen including cooktop, oven, microwave, dishwasher, rice cooker; plus the Studio has a kitchenette. There is a 40-inch TV with streaming media, five-person lounge, western bedding, en suites and TVs in all bedrooms, washer/dryer. Two extra guests are permitted on futon mattresses (see “Extras” below). 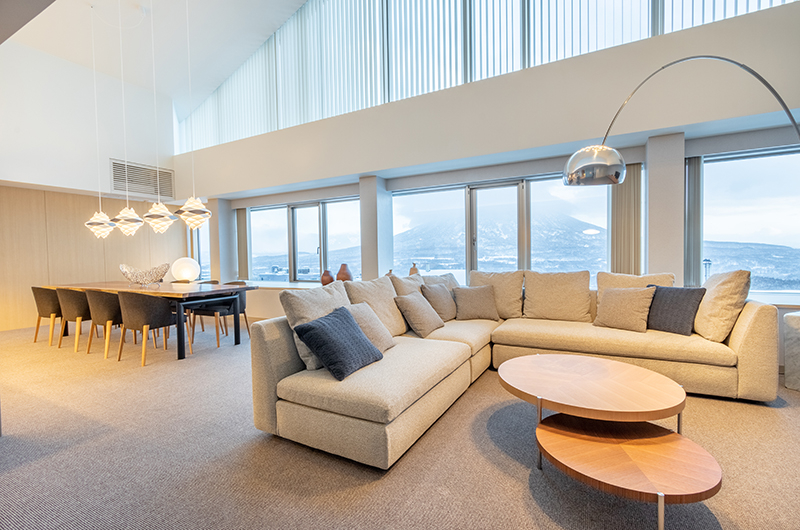 There is one of these apartments on Level 6 with panoramic Mt Yotei views. 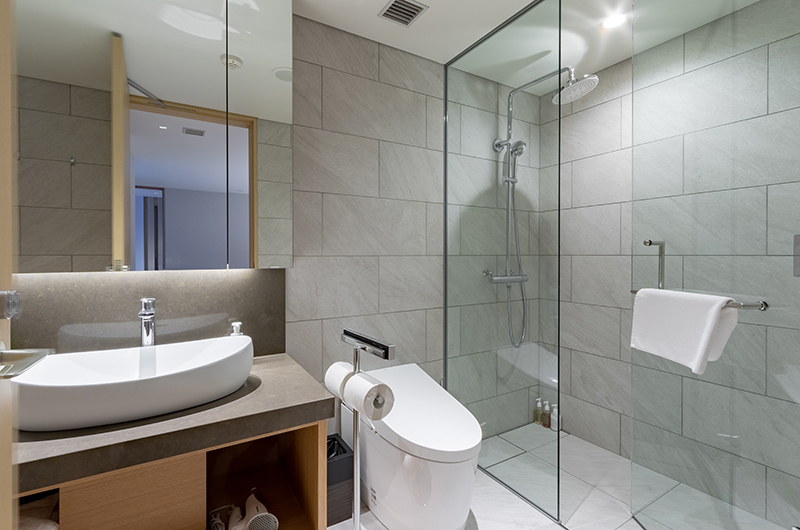 Level 6 apartments have superior fittings and furniture to the rest of the building. 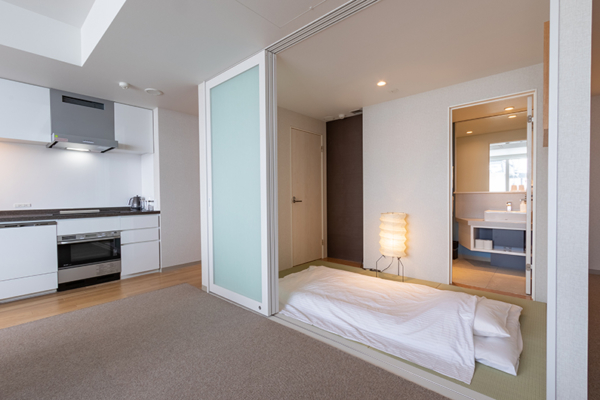 This is a 2-bedroom + Studio apartment. It has an eight-person dining table; full kitchen including cooktop, oven, microwave, dishwasher, rice cooker; plus the Studio has a kitchenette. There is a 40-inch TV with streaming media, five-person lounge, two-person sofa, western bedding, en suites in all bedrooms, TVs in the master and studio, washer/dryer. Two extra guests are permitted on futon mattresses (see “Extras” below). There is one of these apartments on Level 6 with mountain views. 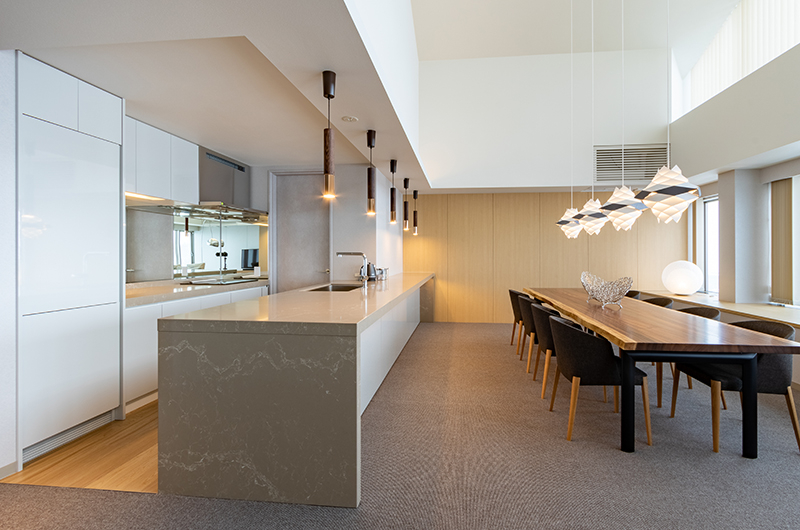 Level 6 apartments have superior fittings and furniture to the rest of the building. It has a six-person dining table and full kitchen including cooktop, oven, microwave, dishwasher, rice cooker. 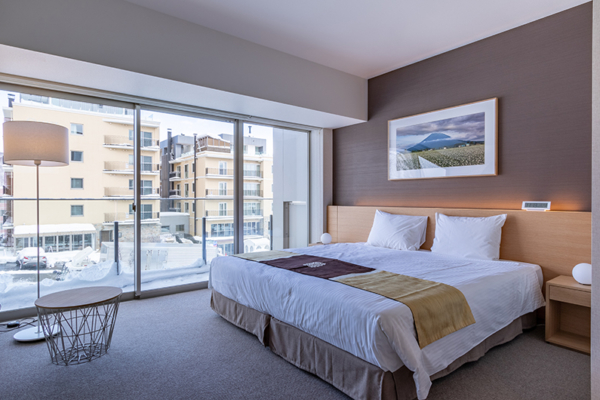 There is a 40-inch TV with streaming media, five-person lounge, two-person sofa, western bedding, en suites in two bedrooms, TV in the master, washer/dryer. Two extra guests are permitted on futon mattresses (see “Extras” below). There is one of these apartments on Level 6 with ski run views. 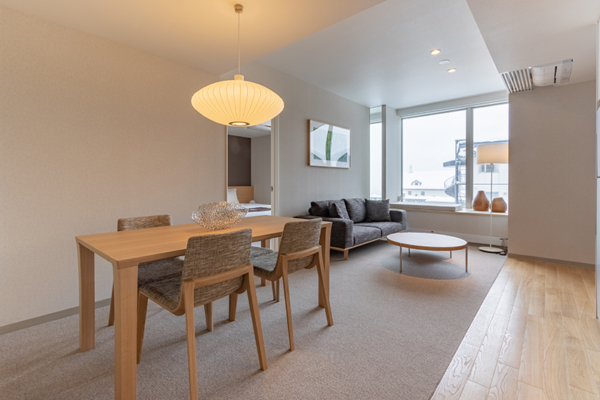 Level 6 apartments have superior fittings and furniture to the rest of the building and this is the most spacious 2-bedroom apartment in the building. It has a four-person dining table; full kitchen including cooktop, oven, microwave, dishwasher, rice cooker. 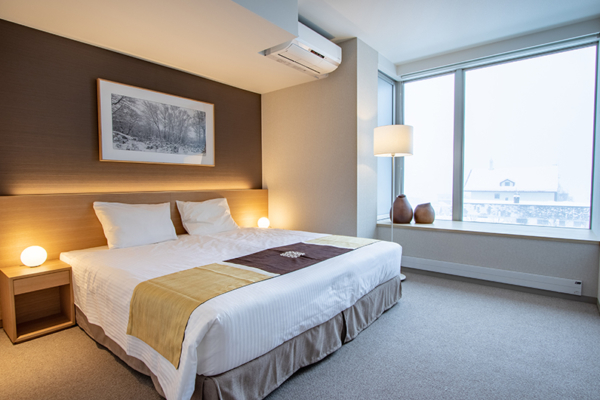 There is a 40-inch TV with streaming media, two-person sofa, western bedding, washer/dryer. Two extra guests are permitted on futon mattresses (see “Extras” below). 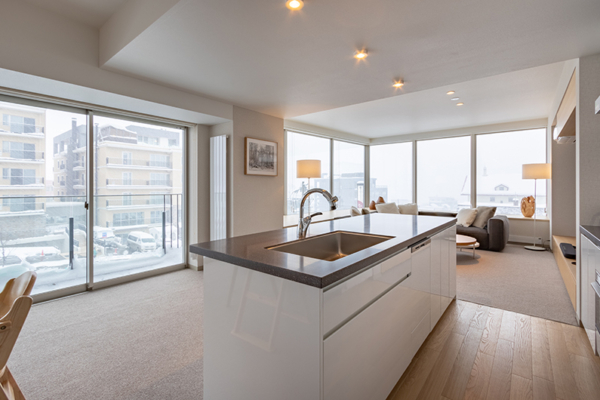 There is one of these apartments on Level 6 with ski run views. 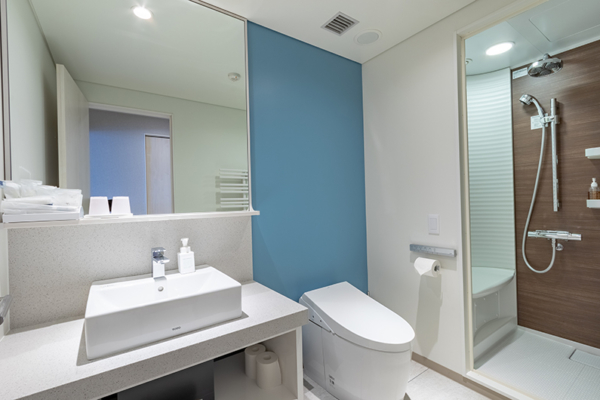 Level 6 apartments have superior fittings and furniture to the rest of the building. It has an eight-person dining table and full kitchen including cooktop, oven, microwave, dishwasher, rice cooker. 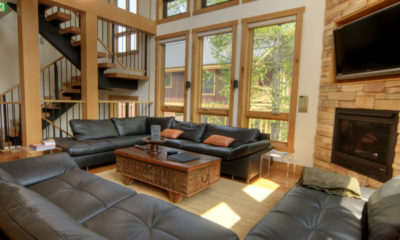 There is a 40-inch TV with streaming media, five-person lounge, two-person sofa, western bedding, washer/dryer. Two extra guests are permitted on futon mattresses (see “Extras” below). 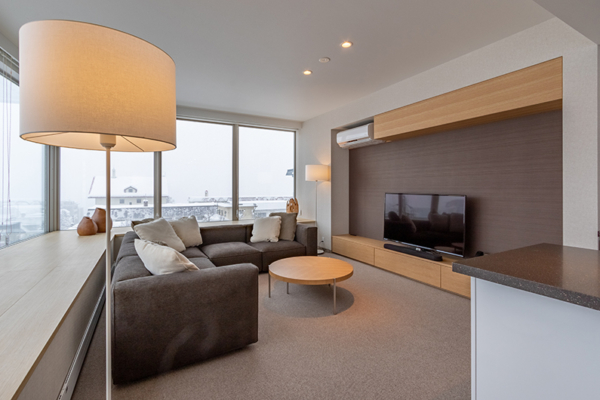 There is one of these apartments on Level 6 with Mt Yotei views. 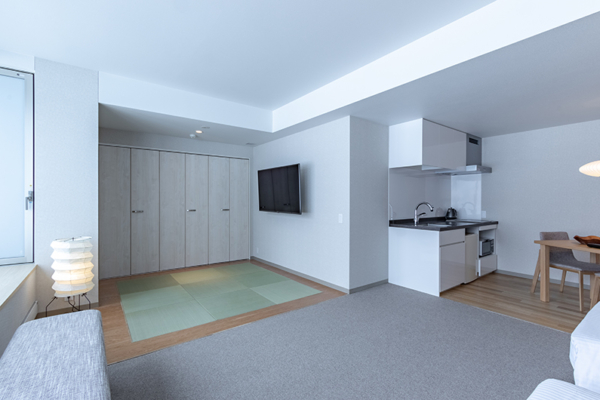 Level 6 apartments have superior fittings and furniture to the rest of the building. It has an eight-person dining table and full kitchen including cooktop, oven, microwave, dishwasher, rice cooker. 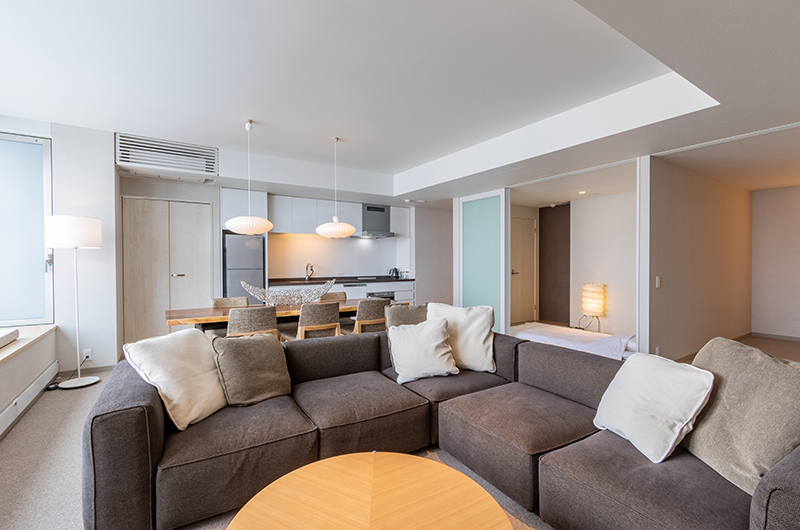 There is a 40-inch TV with streaming media, five-person lounge, extra lounge with two two-person sofas, western bedding, TV in the master, washer/dryer. Two extra guests are permitted on futon mattresses (see “Extras” below). 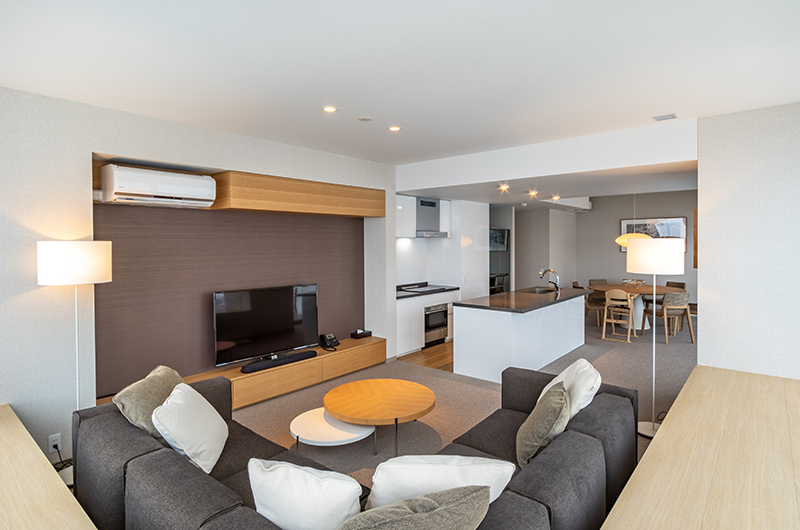 There is one of these apartments on Level 6 with Mt Yotei side views. Level 6 apartments have superior fittings and furniture to the rest of the building. This is a 3-bedroom + Studio apartment. It has an eight-person dining table; full kitchen including cooktop, oven, microwave, dishwasher, rice cooker; plus the Studio has a kitchenette. 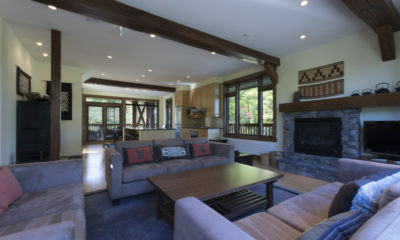 There is a 40-inch TV with streaming media, five-person lounge, extra lounge with two x two-person sofas, western bedding, TV in the master and studio, washer/dryer. Two extra guests are permitted on futon mattresses (see “Extras” below). 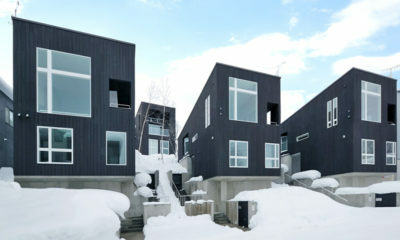 The Maples is located in the beating heart of Niseko – Upper Hirafu village, halfway up the main street, Hirafu-Zaka. All around on the village side are shops, a supermarket, ski hire, restaurants and bars, so any convenience will almost literally be on your doorstep. Meanwhile the hustle and bustle of the main street transforms to the busy Ace Family Run with a peaceful forest backdrop on the other side. 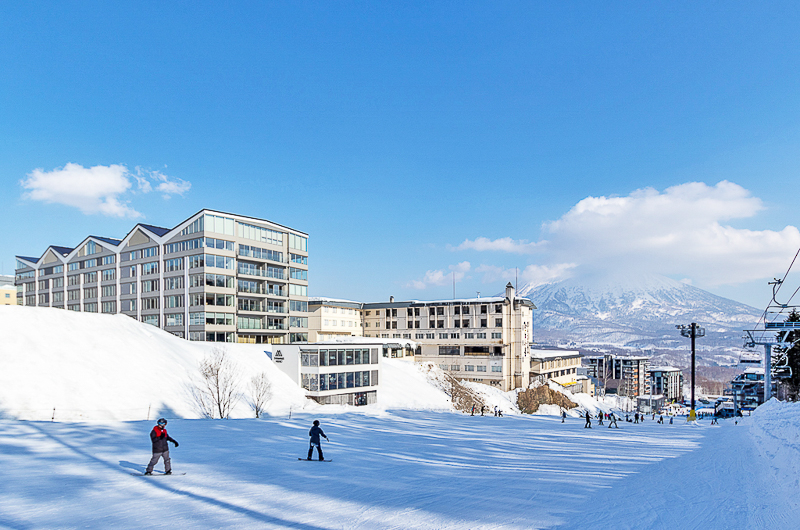 The Maples Niseko is ski-in and ski-out, with the building connecting directly to Hirafu’s Family Run. You can either ski down to the base of the Family Run and take the high-speed Ace Family Quad to get further up the mountain, or if you’d like to warm up your legs you can walk out onto the main street and five minutes uphill to main quad lift. The Maples is also very close to shuttle stops and the Welcome Centre making it easy to get further afield. 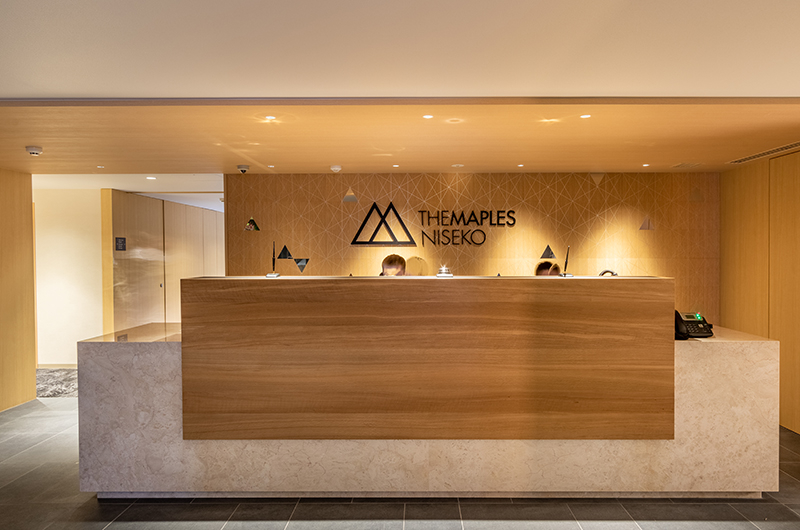 The Maples is primely located right near two of Niseko’s most famous izakayas, A-Bu-Cha and Bang Bang, although you may need to book well ahead or be prepared to line up early to get a seat. 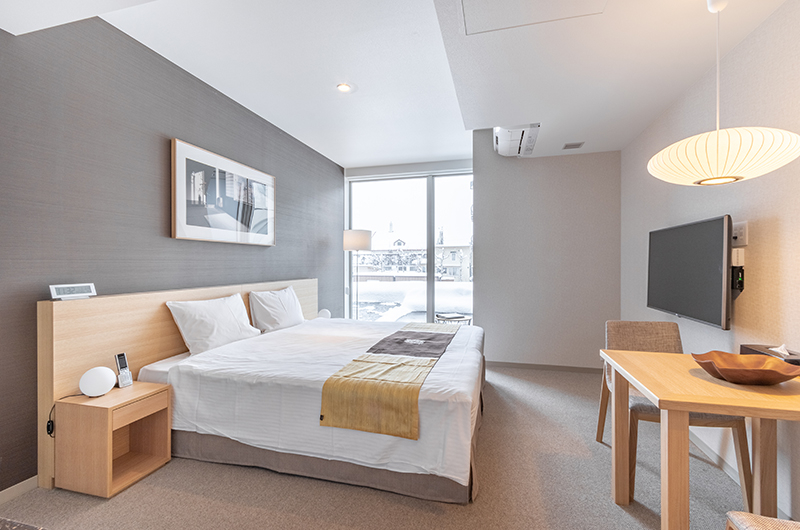 There are dozens more restaurants and bars within less than five minutes walk, and it’s even not too far to stroll down to the main intersection and into Middle Hirafu where you can experience a whole lot more. Best of all, don’t worry about needing a taxi if you stay out late. The staff at the front desk were lovely and very helpful. They offered to help with luggage and I thought were really looking out for the guest and would say the best reception we had in Niseko upon check-in. The lady that checked us in (forgot her name) was very professional when it came to running through the T&C’s and general introduction to the property. We stayed in the 3 bedroom apartment overlooking the ski run. 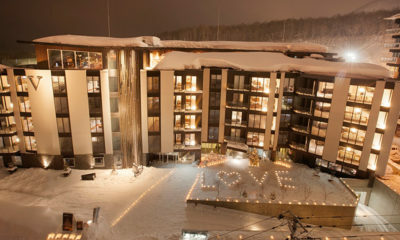 The views of the ski run are amazing and truely some of the best views from an apartment. I think this side was actually better than Mt Yotei. 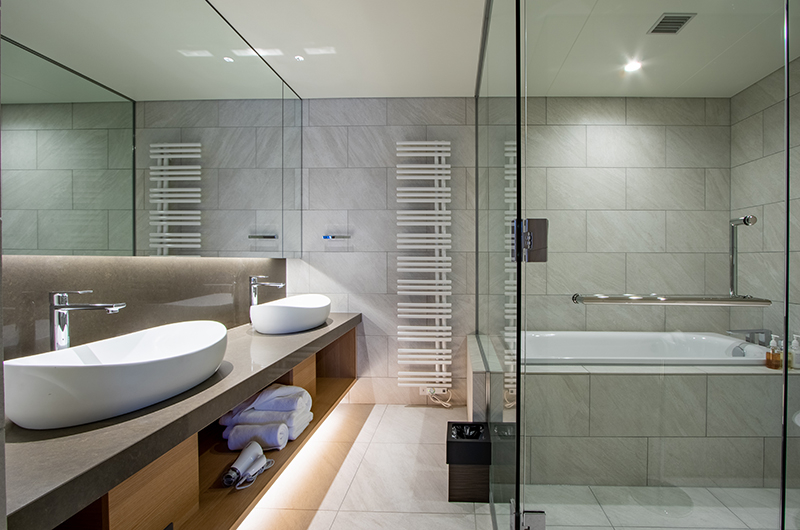 The colour tones are perfect and give the apartment a very sophisticated vibe. 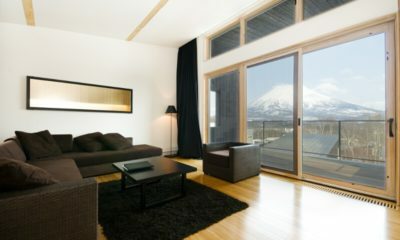 Highly recommend the apartment for those who want a great base while in Niseko. 10 out of 10! Beautiful modern apartments looking out to the ski hill. The ski lockers have direct ski in/ski out access to the Ace family run and there are restaurants and a small supermarket right across the street. Perfect! It’s really a nice place, near the ski slope and the supermarket. Good staff very nice can help in many ways. 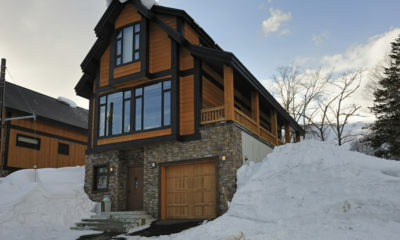 One of the most popular new ski-in and ski-out properties in Niseko! This property is very cool with a range of apartments to choose from. 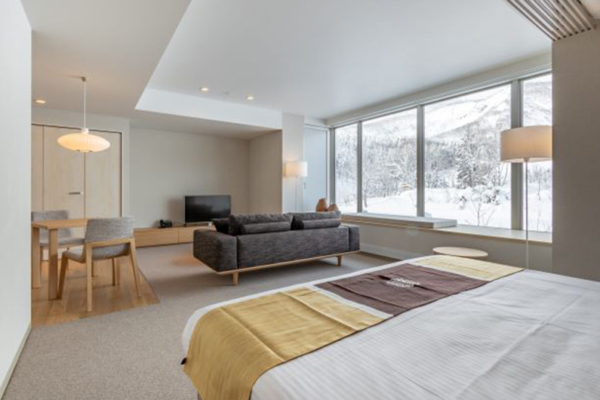 Asahi Lodge features spacious Canadian-style ski holiday luxury with stunning outlooks.